In a way, the aim is to restore deepest listening awareness, the sweets waters for the garden of music and whose delicious fruits are harmony brought to life. May we learn to accompany all phenomena just as they arise, in every sphere of our lives! 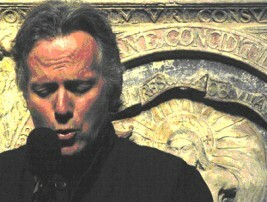 I am mesmerized and transported by the harmonic sounds that David Hykes makes and has experimented with over the years. He has returned to the US so take any opportunity you can to obtain his music, study with him or attended gatherings and performances. My brief introduction to his methods at the New York Open Center convinced me that the harmonic sounds created as the body exhales are powerful on untold multiple levels including: the spiritual and transformative, that of bliss and emotion, health and healing, communication and group resonance and more. My own feeble attempts filled me with wonderment as the vibratory sounds echoed up the body on exhale and my work with forms of energy for healing convinces me that this is another way to inspire healing from within.